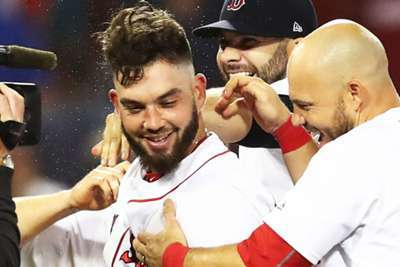 The Boston Red Sox defeated the Philadelphia Phillies 2-1 in 13 innings thanks to Blake Swihart's walk-off ground-rule-double. The game was a pitcher's duel between Phillies ace Aaron Nola and Boston's David Price before Swihart's extra-inning heroics in MLB action Monday. Nola allowed just one earned run off four hits in eight innings. 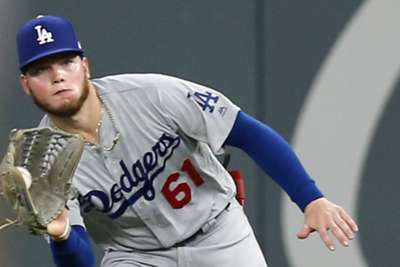 He also struck out six batters, lowering his ERA to 2.35. But Price matched him, also allowing just one run in eight innings. The game then turned to extra innings. The 10th, 11th and 12th went by scoreless, with the relievers picking up where the starters left off. But Swihart – who entered the contest earlier as a pinch hitter – delivered the game-winning hit. Boston (75-33) are 24-6 in their last 30 games, which is their best 30-game span since 2004 when they went on to win their first World Series title in 86 years. In a 5-4 loss to the Minnesota Twins, Cleveland Indians third baseman Jose Ramirez clubbed two home runs (32) and stole a base (24), while also drawing a walk, raising his slash line to a ridiculous .294/.404/ .626 this season. Ramirez's 32 home runs are the most by an Indians player before August since recent Hall of Fame inductee Jim Thome in 2001 (33). Miami Marlins starting pitcher Wei-Yin Chen fell to 3-8 with a 5.86 ERA after allowing five runs with two home runs and three walks in a 5-3 loss to the Atlanta Braves. Chen has now allowed at least five runs in three starts since June 22. Colorado Rockies' Nolan Arenado cleared the bases in impressive fashion. Philadelphia will continue to get a good taste of what it takes to contend for a World Series this season when they face off against MLB's best team. Jake Arrieta (8-6, 3.45 ERA) will take the mound for the Phillies against Drew Pomeranz (1-4, 6.91 ERA).